With oppressive heat comes the doldrums of the MLS season, with teams slogging through the humid air and attempting to stay playoff eligible. Baseball is just not on the Beemsville menu, but the Illini are always on our minds. After a crazy-active off-season in which the three major sports all replaced their head coaches, it’s mostly quiet on the orange & blue front. But, hey, look! A blue helmet! Yes, Coach Beckman has been implementing his changes, including COMPETING! for everything and anything. And, hey, if teams like Oregon and Boise State and Oklahoma State can have multiple uniform-helmet combos and score lots and lots of points, why not Illinois? This design will look good with the orange or white shirts. 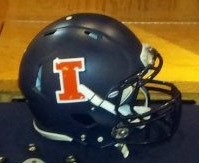 It’s pretty basic, pretty similar to the Bears helmet, and also signals a logo/branding shift Illini fans are just going to have to accept. Athletic Director Mike Thomas has spoken about the importance of marketing/branding in college sports, how it builds familiarity, opens doors, sells shirts, etc. And since the Chief was taken from us (and even before that as they moved away from that symbol), the Block I has pretty much become the symbol and logo. Thomas has stated he wants to reinvigorate from a marketing/branding standpoint, so we should expect some kind of new variation on the Block I as an official logo. How much can you really do with a Block I? You don’t want it in italics. You can’t add a bunch of bling. They’re probably afraid to add any flourishes like feathers that might offend sensitivities of the anti-Illini crowd. At least we’re pretty much the only ‘I’ team in orange and blue. It’s been a rough stretch for Illini fans. Usually we’re buoyed by (often misplaced) optimism this time of year. It’s tournament time and you have some talent; with a little luck and some inspired play you make a run. Or not. The last five-six years it’s been not. Not enough wins, not enough recruits, not enough March success. That’s why Bruce Weber was fired on Friday. It wasn’t the epic collapse (10 of the last 12 losses), so no – don’t blame AD Mike Thomas for not giving the cliched ‘Vote of Confidence’ a month ago. This is what Tom Izzo did in a post-game rant, also on Friday. If you care to look, you’ll see that his rant was eerily similar in theme to his response to Tom Lickliter’s firing by Iowa two years earlier. Izzo and Weber have been close for years, so we’ll forgive him the reaction, but the truth is the Weber-led Illini are much less a threat to Michigan State’s perch atop the conference than some of the alternatives. I watched Bruce’s statement on Friday. It made me sad. Sad because a hard-working guy who has class and treats people the right way could not attain the level of success needed. It’s a pretty damning commentary on the state of college hoops that a guy like Bruce Weber gets sacked while a guy like John Calipari not only gets a pass for his indiscretions, he thrives. …or, like Wile E. Coyote, have they already gone over the cliff but have yet to realize it? Since our last entry on the topic, Bruce Weber’s Illini have dropped three straight. Three straight close games, two of which came down to the final play of regulation and included some pretty terrible calls by the officials. But that’s three losses, which drops them out of any aspirations for the conference title and begins to put NCAA tourney hopes on thin ice. Realistically you wanted to win two out of the last three if you’re for real. But these Illini are what they are – a pretty tough defensive team (though not elite) prone to long futile offensive lapses. They have some good athletes and good role-players, but at certain positions lack enough skill or talent to put them into contention for the Big 10 and deep tourney runs. This has been the case for the majority of Bruce Weber’s tenure. According to Illini beat writer Paul Klee, in the years AD (After Dee) the Illini are .500 in conference play: 48-48. That’s not good enough for Illini fans.